This Saturday has been all about fan-fiction and children’s literature for me. I have been researching and reading and canvassing every line on the web for participatory readers and online sharing communities – anticipated thesis fever is hitting me after the summer vacation and I am knee-deep in theories and literature, it is so exciting (for future reference remember this joyous occasion, this positive attitude might not prevail over the hair-pulling and nail-biting when it is crunch time). Anyone out there with some inside knowledge of online fan-fiction is welcome to my comment field. Manu Sareen's latest children's books. 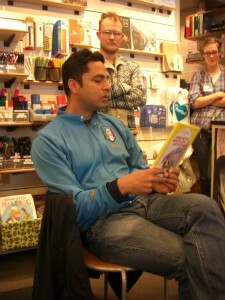 Harders, our local Nørrebro bookshop, had arranged a reading with Manu Sareen that I thought sounded incredibly interesting. 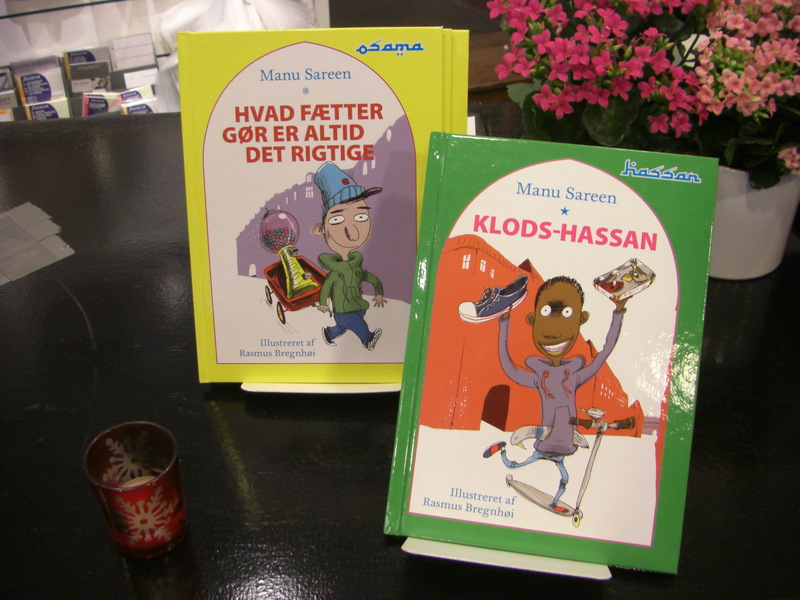 For those of you who do not know his works, he is the author of the series on “Iqbal Farooq” – the humorous story of an immigrant family living in the heart of Nørrebro – and has just published two stories (seen in picture above) in a series loosely based on some of H.C. Andersen‘s fairy tales. One of the reasons I wanted to go to this event was because Sareen is one of Denmark’s contemporary authors (without distinguishing adult from children’s authors) who uses his background as an Indian immigrant as a starting-point for his stories. He explains early on that he started writing because of political motives, stating that there was a gap in literature for and about ethnic minorities in this country. Another reason was because at that time the Minister of Cultural Affairs, Brian Mikkelsen, had just launched a culture canon to profile Danish values – values Sareen says he shared, such as democracy and free speech, but unfortunately values that also ended up being used as a lifted finger against ‘the foreigners’ in the country, dividing inhabitants even more. A “this is what it means to be Danish – a.k.a. not You”. So he created Iqbal in order to send a message. Not only to the ethnic Danes, but especially to the immigrants. Sareen claims that often literature written by minorities ends up reaffirming the negative discourse, whereas he would rather give the ethnic groups some pride back, something that could unite and identify them as part of the community. The next thing he said shook me somewhat. I must admit, although I am not oblivious to the culture clashes in this country, I had not really thought fully about this: he said that he encountered many ethnic kids on his readings that were ashamed of the things that set them apart from the ethnic Dane, amongst other things their parents dialect when speaking Danish. And that faith in future achievements was depressingly low. 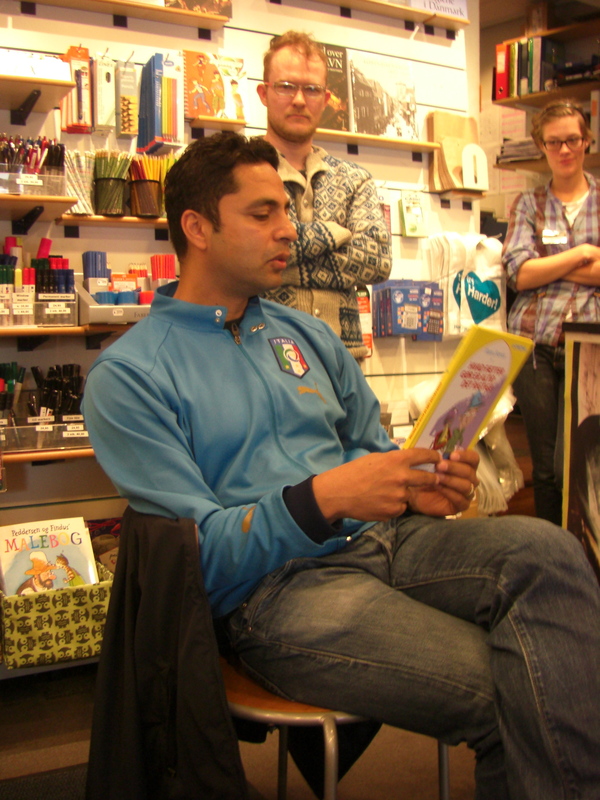 Immigrants, he said, could drive taxi’s and make pizza’s: not grow up to write children’s books; which is an attitude he encounters when young minorities come up to him at readings in schools and ask him who really wrote the book he is reciting. This is a disillusionment Sareen wants to stand against. He says his goal is to make readers laugh with each other rather than at each other. Sareen then proceeded to explain how his characters are based on real persons, to the great joy of a little kid in the room who said “I knew it”, which in return put an even broader smile on Sareen’s face. At that time it was clear that the adults in the room were mere shadows in the setting. When he read from one of the Iqbal books (Iqbal Farooq and the Indian Superchip) I noticed how Sareen’s books use humor, preconceived notions of the ‘Other’ and stereotypes to form a narrative that touches upon some, at times, very disturbing and tough subjects in an approachable way, making these topics easier to talk about rather than avoiding them. Being that he gets inspiration from his surroundings, his books are filled with multi-cultures and political figures – which adds to the fun for those who know these characters. 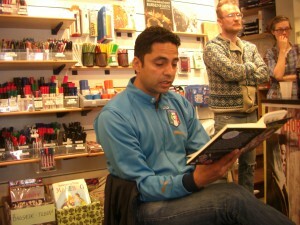 Reading from "Hvad fætter gør er altid rigtigt"
Whereas the Iqbal character was loosely based on his own person and characters of that universe of those around him, Sareen chose to go outside his own surroundings in “Hvad fætter gør er altid det rigtige”, saying proudly that this has been his best book so far. It is also a book that is, in his words, “semi-controversial”, joining a trend in Western children’s literature of using unorthodox characters and settings. “Hvad fætter gør er altid det rigtige” includes homeless people, prostitutes and drug addicts surrounding the Copenhagen quarter of Vesterbro. As many children’s authors who chose, what some would call extreme figures, to portray in the books, he justifies it by saying that this is what the world looks like – teaching children that it’s out there can prove to have a positive effect. I asked him if he drew his inspiration to write from any external sources outside of Denmark, seeing as he claims that ethnic minorities were not writing to/about ethnic relations in Denmark. But instead he said he drew his inspiration from Olsen banden (classic Danish comedy) and Bjarne Reuter, stuff he, as well as the rest of Denmark, grew up with – only he had one foot in each culture at all times. Setting aside that these books are classified children’s literature I would think that many adults could benefit from reading one or two of his books, maybe we could all loosen up a bit for a change.